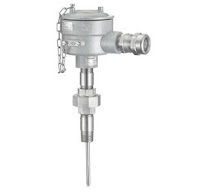 The Foxboro Model LG01 Radar level measurement transmitter provides very accurate and reliable level measurement for the widest choice of installation and application. Electromagnetic pulses are emitted and guided along a probe. These pulses are reflected back at the product surface. The distance is calculated by measuring this transit time. This device is perfect for high-end applications. It is suitable for applications with foam, dust, vapor, agitated, turbulent or boiling surfaces with rapid level changes. This video demonstrates the quick set up of the instrument. 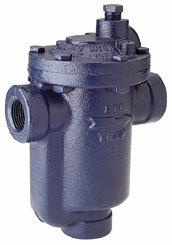 What are In-line Drain Separators? Condensate in steam and air piping reduces thermal efficiency, causes water hammer, corrodes equipment such as valves and pipes, and causes other problems. 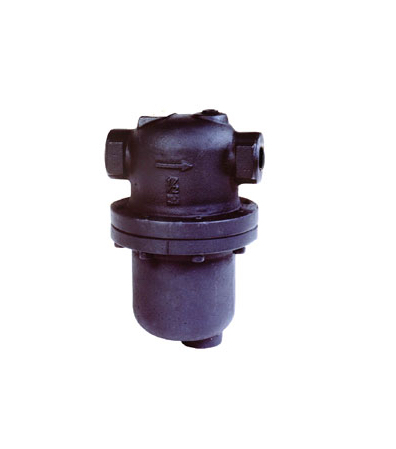 In-line (drain) separators separate condensate efficiently by using the centrifugal force of steam or air created by introducing it into a specifically shaped path. Because of the simple structure of the drain separators, pressure loss is minimized, enabling clean, dry steam or air to be fed to equipment. When steam or air flow enters the drain separator, centrifugal force is generated in the fluid because of the device’s internal structural design. The fluid drains along the wall because of the difference in specific gravity with steam or air, eventually striking the baffle. The baffle guides the fluid to the drain outlet and to the trap, which drains it. As a result, small dirt particles and condensate are separated and removed from the system through the bottom drain. Sight glass liquid level gauges are a mainstay of fluid processing operations that store raw materials, intermediate, or final product in tanks and other vessels. Having a direct visual indication of fluid level at the tank enhances safety and provides the all important data point about what is happening inside the tank. These level gauges are installed on the exterior of the tank, exposed to whatever environmental or operational hazards existing or occurring at the location. Armored level gauges are appropriately named because of their construction. 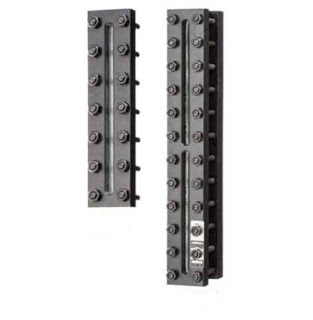 They are designed to resist impact and mechanical stress, as well as a range or environmental conditions. There are generally two versions of armored level gauges, reflex and transparent. The names refer to way in which light is handled by the gauge to reveal the liquid level. One manufacturer of armored level gauges and other level instruments, Clark-Reliance, provides a good description of the two gauge types. "Jerguson® Reflex Level Gauges are ideal for clean total level indication applications for refining, petrochemical and general use applications. The reflex prisms are molded and polished to provide a crisp black-silver bi-color indication of the fluid level. As light passes into the reflex glass, if there is fluid present, the light continues through the glass and reflects off the back of the level gauge, providing a black color for fluid level regardless of the actual color properties of the process fluid. If fluid is not present, the light is reflected off the glass back towards the user, providing a shiny silver or mirror-like appearance to indicate vapor space." 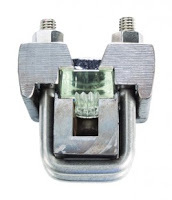 "Jerguson® Transparent Level Gauges are selected for interface level indication, dirty service or any application that requires the use of a shield to protect the glass from corrosion. A transparent gage is also known as a “thru-vision” gauge since the gauge is constructed with two pieces of flat polished glass assembled on opposite sides of the level gauge chamber. Since the user can see straight through the gauge, it is also easy to view the fluid properties, such as color, whereas this would not be possible with a reflex gauge. The use of an illuminator is always recommended on a transparent gauge." Selecting an armored level gauge is an exercise in preparing for known and unknown events that might disable your ability to directly read fluid level. Armored level gauges are employed extensively in chemical, petrochemical, and other industries where reliability under challenging conditions is essential. Wherever there are mechanical hazards, an armored level gauge may ultimately prove to be cheap insurance against downtime or delay. 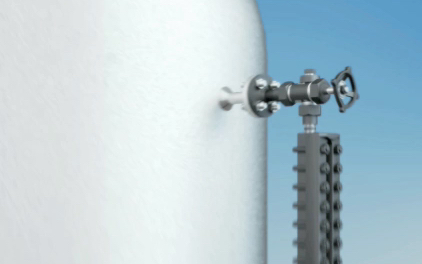 Share your level measurement challenges with a product application specialist. 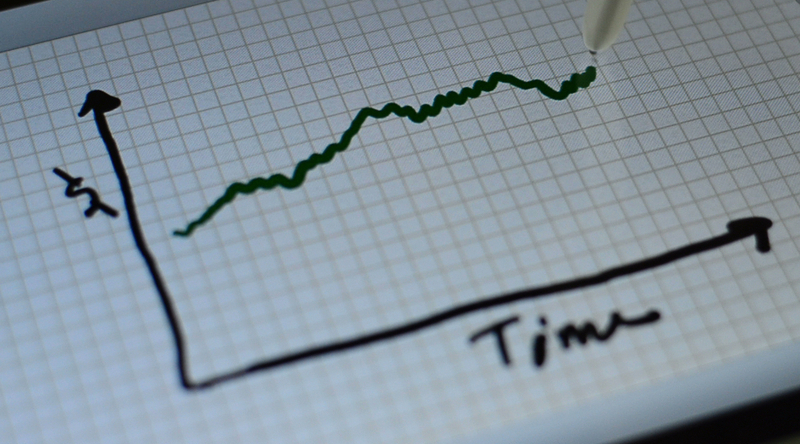 Combine their product expertise with your process knowledge to produce an effective solution. Cost cutting is a fact of life for all industries. Whether it be for more efficient operations, or complying to current regulations, the need to build a better mouse trap is always present. A very promising cost-cutting technology is wireless instrumentation. Wireless provides a compelling argument to change when you consider installation and overall cost effectiveness. Even more so when the application is located in a harsh environment, or where toxic or combustible situations exist. These robust devices provide critical performance data around the clock in the most inhospitable place in the plant, and operate through rain, wind, high temperatures and high humidity. Untethered by cables and hard-wiring, wireless instrumentation is easier to deploy and monitor. Wireless transmitters are available for monitoring virtual all process variables such as pressure, temperature, level, flow, density, and acoustics. Networks of up to 100 (900 MHz) field devices can be created and then monitored by a single base radio or access point, with a typical communication range of over 1/2 mile. By communicating through the industry standard, Modbus, compatibility between device manufacturers is ensured. The most obvious reason for choosing wireless over hard-wiring is the cost savings associated with running wires and cables. Savings estimates as high as 70% can be realized by deploying wireless field devices, compared to the same application using cables. Additional savings are realized when you consider that these devices use batteries and that the cost of adding to a network is borne only by the cost of the new device. Wireless instruments also provide significant benefits in safety and compliance by keeping personnel out of hazardous areas. Areas that would require occasional human visitation can be safely monitored through remote monitoring. So, what's the hold up? If the benefits are so clear, and the argument is so strong, why is there still reluctance to embrace wireless technology? Wireless instrumentation must provide the same reliability (real and perceived) as traditional wired units. Every engineer, operator and maintenance person knows wires. Troubleshooting wires is easy, and understanding the failures of wires is basic - the wire is either cut or shorted. With wireless however, air is the communication medium and radio signals replace wires. 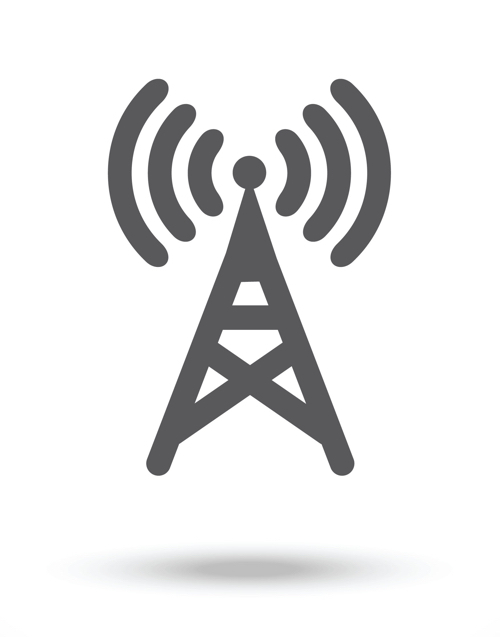 Radio signals are more complicated than wires in terms of potential problems. For instance, signal strength, signal reflection and interference are all possible impediments to reliable links. The good news is that radio frequency design is continuously improving, and the use of new and advanced technologies, such as frequency hopping receivers and high gain antennas, are enabling wireless devices to create highly reliable links. Wireless instrumentation networks have to adapt to the existing environment and the placement of structures and equipment. Most times it's just not practical to relocate equipment just to create a reliable wireless link. This can make it challenging to find the optimum location for a base radio or access point that is capable of providing a reliable communication link to your wireless instruments. Furthermore, accommodating the best strategy for one wireless device could negatively affect links with other devices on the same network. The challenges of adaptability are being overcome by providing better frequency bands (such as 900 MHz). These bands provide longer range, the ability to pass through walls, and offer more saturating coverage. Other ways to overcome adaptability concerns are through the use of external, high gain antennas mounted as physically high as possible, and also by using base radios with improved receiving sensitivity. Engineers, operators, and maintenance crews are challenged by integrating wireless instrumentation networks with other, existing, field communications systems. The issues of having to manage and troubleshoot multiple networks adds levels of complexity to existing systems. This creates a conflict between the financial argument to adopt wireless instrumentation and the possible costs to increase the data gathering capabilities of an existing system. For instance, SCADA systems need to be able to handle the additional data input from wireless devices, but may not have the capacity. Adding the additional data capacity to the SCADA system can be expensive, and therefore offset the wiring and cabling savings. The financial argument for industry to adopt wireless instrumentation networks is persuasive, but its acceptance in the process control industry is slow. Reliability, acclimation, and integration are all challenges that must be overcome before widespread adoption occurs. Eventually though, the reality of dramatically reduced deployment and maintenance costs, increased safety, and improved environmental compliance will tip the scale and drive wireless as the standard deployment method. Always consult with an experienced applications engineer before specifying or installing wireless instrumentation. Their experience and knowledge will save you time, cost, and provide another level of safety and security. 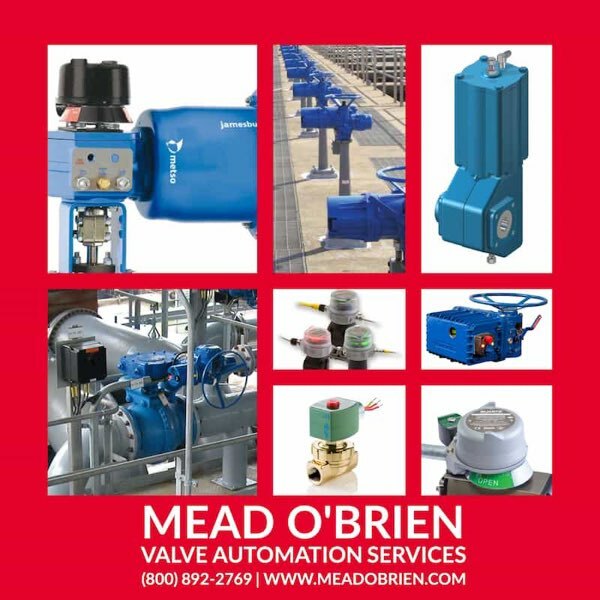 Mead O’Brien specializes in valves & valve automation, steam & hot water products and systems, instrumentation products, skid designs, field services, surveys, assessments, and consulting. The extensive product and application knowledge possessed by the Mead O'Brien sales force projects to all or part of ten states in the Midwest which includes Missouri, Kansas, Nebraska, Iowa, Oklahoma, Arkansas, Texas Panhandle, Southern Illinois, Western Kentucky, and Southwest Indiana. Steam boiler level control diagram. Steam boilers are very common in industry, principally because steam power is so useful. Common uses for steam in industry include doing mechanical work (e.g. a steam engine moving some sort of machine), heating, producing vacuums (through the use of “steam ejectors”), and augmenting chemical processes (e.g. reforming of natural gas into hydrogen and carbon dioxide). The process of converting water into steam is quite simple: heat up the water until it boils. Anyone who has ever boiled a pot of water for cooking knows how this process works. Making steam continuously, however, is a little more complicated. 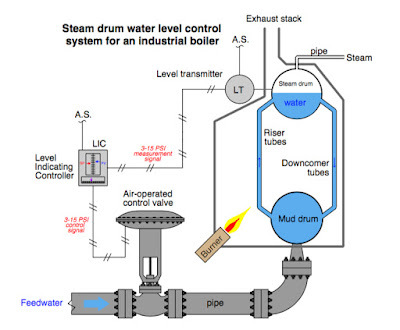 An important variable to measure and control in a continuous boiler is the level of water in the “steam drum” (the upper vessel in a water-tube boiler). In order to safely and efficiently produce a continuous flow of steam, we must ensure the steam drum never runs too low on water, or too high. If there is not enough water in the drum, the water tubes may run dry and burn through from the heat of the fire. If there is too much water in the drum, liquid water may be carried along with the flow of steam, causing problems downstream. 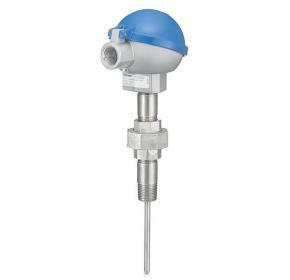 The first instrument in this control system is the level transmitter, or “LT”. The purpose of this device is to sense the water level in the steam drum and report (“transmit”) that measurement to the controller in the form of a signal. In this case, the type of signal is pneumatic: a variable air pressure sent through metal or plastic tubes. 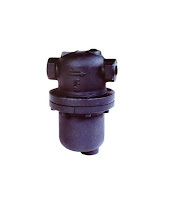 The greater the water level in the drum, the more air pressure output by the level transmitter. Since the transmitter is pneumatic, it must be supplied with a source of clean, compressed air on which to operate. This is the meaning of the “A.S.” tube (Air Supply) entering the top of the transmitter. This pneumatic signal is sent to the next instrument in the control system, the level indicating controller, or “LIC”. The purpose of this instrument is to compare the level transmitter’s signal against a setpoint value entered by a human operator representing the desired water level in the steam drum. The controller then generates an output signal telling the control valve to either introduce more or less water into the boiler to maintain the steam drum water level at setpoint. As with the transmitter, the controller in this system is pneumatic, operating entirely on compressed air. This means the output of the controller is also a variable air pressure signal, just like the signal output by the level transmitter. Naturally, the controller requires a constant supply of clean, compressed air on which to run, which explains the “A.S.” (Air Supply) tube connecting to it. 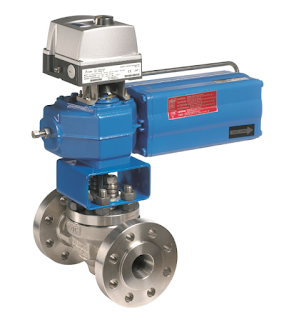 The last instrument in this control system is the control valve, operated directly by the air pressure signal output by the controller. Its purpose is to influence the flow rate of water into the boiler, “throttling” the water flow more or less as determined by controller. 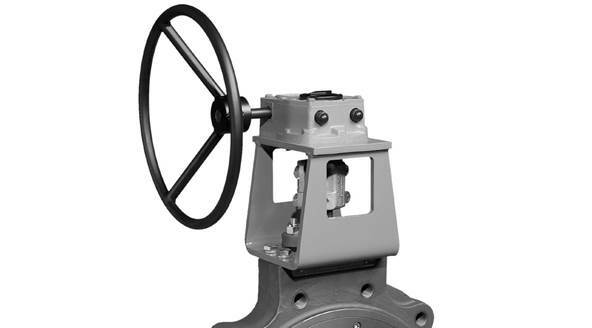 This particular type of control valve uses a large diaphragm and a large spring to move the valve further open with more signal pressure and further closed with less signal pressure. 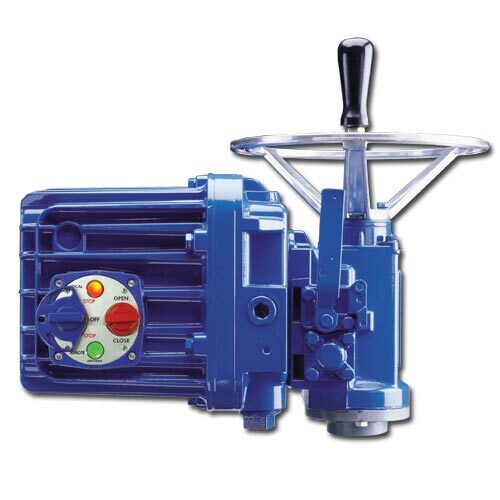 When the controller is placed in the “automatic” mode, it will move the control valve to whatever position necessary to maintain a constant steam drum water level. The phrase “whatever position necessary” suggests the relationship between the controller output signal, the process variable signal (PV), and the setpoint (SP) is complex. If the controller senses a water level above setpoint, it will close off the valve as far as necessary to decrease the water level down to setpoint. Conversely, if the controller senses a water level below setpoint, it will open up the valve as far as necessary to raise the water level up to setpoint. What this means in a practical sense is that the controller’s output signal (equating to valve position) in automatic mode is just as much a function of process load (i.e. how much steam is being used from the boiler) as it is a function of setpoint (i.e. where we wish the water level to be). Consider a situation where the steam demand from the boiler is very low. If there isn’t much steam being drawn off the boiler, this means there will be little water boiled into steam and therefore little need for additional feedwater to be pumped into the boiler. Therefore, in this situation, one would expect the control valve to hover near the fully-closed position, allowing just enough water into the boiler to keep the steam drum water level at setpoint. If, however, there is a high demand for steam from this boiler, the rate of evaporation will be much greater. 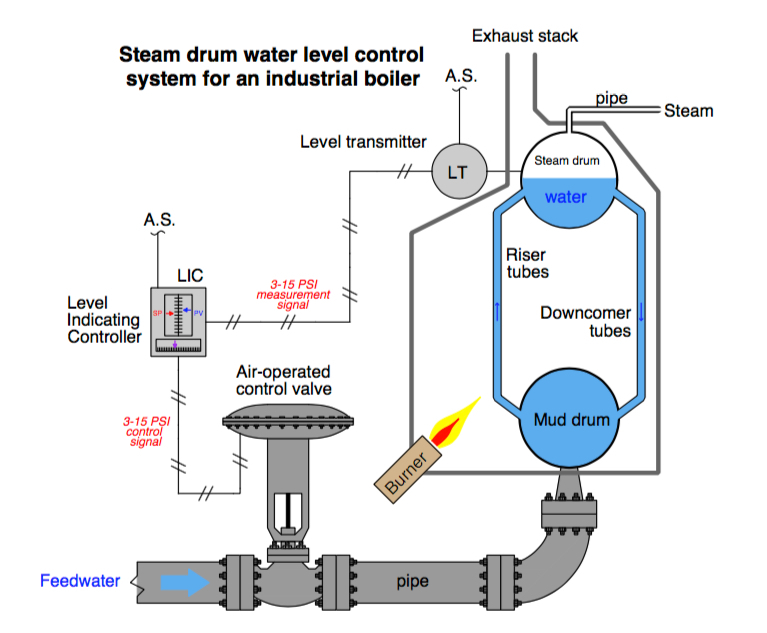 This means the control system must add feedwater to the boiler at a much greater flow rate in order to maintain the steam drum water level at setpoint. In this situation we would expect to see the control valve much closer to being fully-open as the control system “works harder” to maintain a constant water level in the steam drum. Thus, we see how the controller automatically positions the control valve to react to different boiler operating conditions even when the setpoint is fixed. A human operator supervising this boiler has the option of placing the controller into “manual” mode. In this mode the control valve position is under direct control of the human operator, with the controller essentially ignoring the signal sent from the water level transmitter. Being an indicating controller, the controller faceplate will still show how much water is in the steam drum, but it is now the human operator’s sole responsibility to move the control valve to the appropriate position to hold water level at setpoint – in manual mode the controller takes no corrective action of its own. Manual mode is useful to human operators during start-up and shut-down conditions. It is also useful to instrument technicians for troubleshooting misbehaving control systems. Placing a controller into manual mode is akin to disengaging the cruise control in an automobile, transferring control of engine power from the car’s computer back to the human driver. One can easily imagine an automobile mechanic needing to throttle a car’s engine “manually” (i.e. with the cruise control turned off) in order to properly diagnose an engine or drivetrain problem. This is true for industrial processes as well, where instrument technicians may need to place a controller into manual mode in order to properly diagnose transmitter or control valve problems. 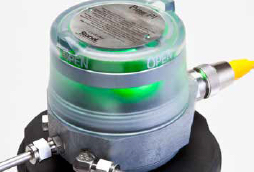 The Foxboro / Schneider Electric I/A Series Electronic Pressure Transmitters are a complete family of D/P Cell, gauge, absolute, multirange, multivariable, and premium performance transmitters, as well as transmitters with remote or direct connect seals, all using field-proven silicon strain gauge sensors and common topworks. A common HART electronics module is used for all HART Pressure Transmitters. Also, because all configuration and calibration data is stored in the sensor, you can replace a HART module with another HART module without transmitter reconfiguration or recalibration. The video below provides step-by-step instructions for two point calibration of the IDP-10-T pressure transmitter. 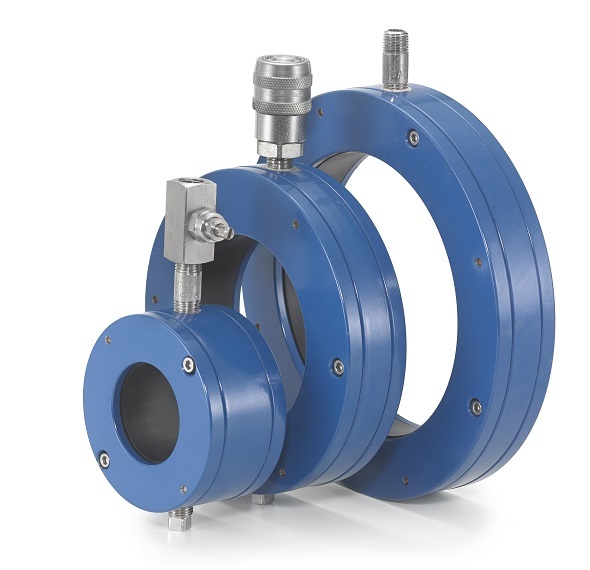 Metso's Neles® T5 series top entry rotary ball valves are designed to meet the requirements of chemical, petro-chemical and refining industries with improved process safety and efficiency of plant. T5 series valves with famous trunnion mounted Stemball® design are suitable with wide rangeability for demanding heavy duty rotary control applications such as crude oil, hot residual oil, LPG and other hydrocarbon gases and vapors under medium and high pressures. 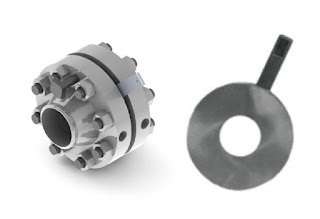 Unique Stemball® design combined with anti-cavitation and low noise Q-trim technology are making the T5 series valve most suitable with wide rangeability for demanding control applications like anti surge and blow down services. The new high noise reduction Q2-trim is available for gas applications. Metso Neles T5 Series Top Entry Rotary Ball Valves from Mead O'Brien, Inc. The Coriolis effect, a derivative of Newtonian motion mechanics, describes the force resulting from the acceleration of a mass moving to (or from) the center of rotation. As this video demonstrates, the flowing water in a loop of flexible hose that is “swung” back and forth in front of the body with both hands. Because the water is flowing toward and away from the hands, opposite forces are generated and cause the hose to twist. 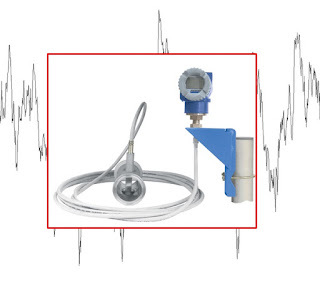 Coriolis flowmeters apply this principle to measure fluid flow. (800) 892-2769 or by visiting https://www.meadobrien.com. Pharmaceutical and biotech companies are facing increasing competition, driving their need for increased efficiency, reduced costs, and agility. 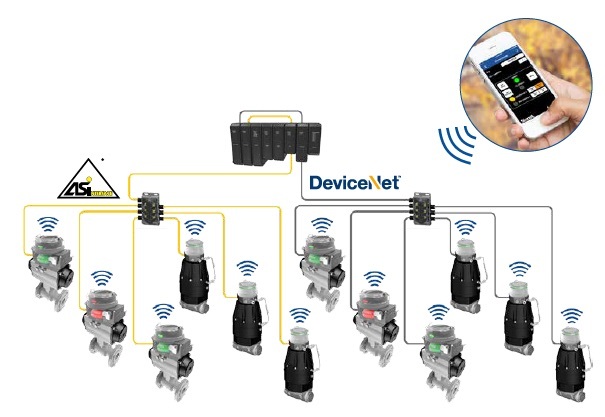 Automated valve systems that help reduce installation costs through easy set up, faster commissioning, and enhanced valve identification are being embraced in these industries. Features such as bright electronic indication, combined with optional remote wireless access systems, provide enhanced risk management and improved safety, which subsequently lowers overall cost. 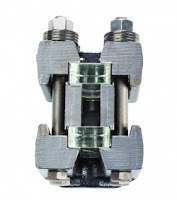 Valve communication modules that offer smaller, lighter and more durable form factors, and modules that conform to the needs of moveable process skids and flexible manufacturing provide operators are very popular in these industries. 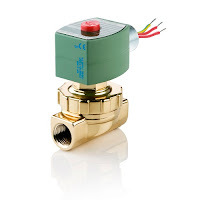 Also, the use of integral solenoid valves lessen the amount of tubing and cabling required for valve packages, affording smaller overall envelope sizes on skids. 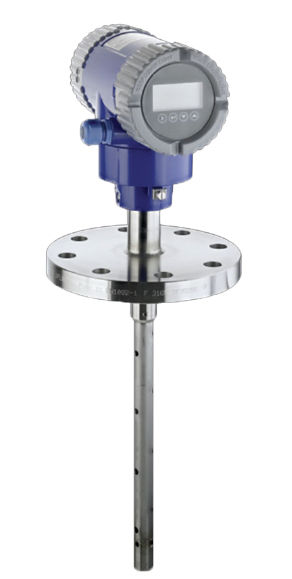 Solid state continuous sensors increase reliability and provide precise position measurement compared to legacy mechanical or proximity-reed technology. 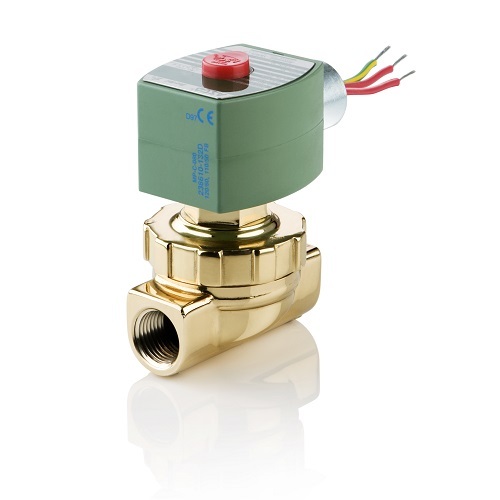 These solid state sensors also allow for more sophisticated valve diagnostics, leading to reduced maintenance costs over the valve system's life cycle. 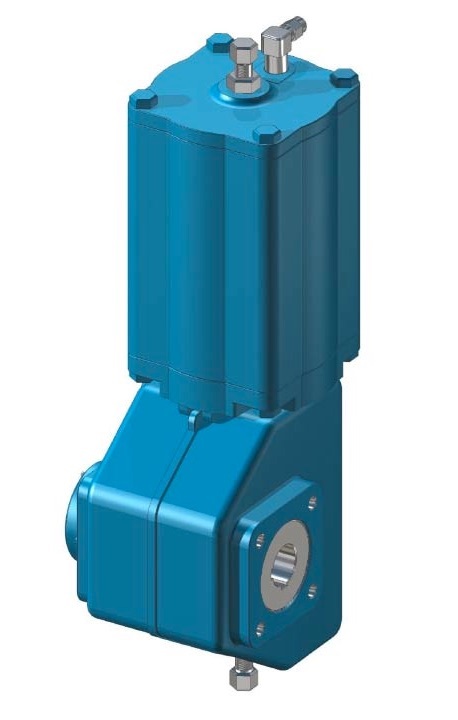 The information available for critical valve operating parameters allow operators to see potential problems early, thereby reducing the risk and potential expense from lost production and downtime. 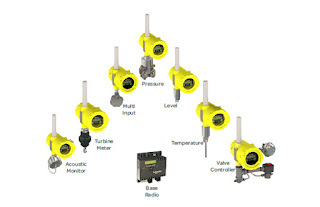 Remote valve function monitoring, which includes sensor temperature and cycle count, extends the life of critical valves and helps maintenance staff circumvent a problem before it causes a dangerous situation. Wireless communications and control modules allow operators to access difficult to reach valve systems safely, securely and conveniently. Critical situations are known and dealt with immediately from safe locations, and away from potentially dangerous areas or circumstances. 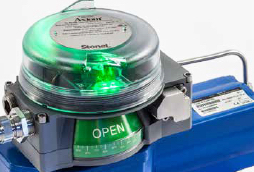 Combining components such as StoneL’s Prism or Axiom platforms with a DeviceNet or AS-Interface protocol system to interconnect your automated valves will lower your construction costs and install faster than conventional systems. Additionally, using valve monitoring apps such as StoneL Wireless Link with standard iPads or iPhones provide further cost savings and security is assured. 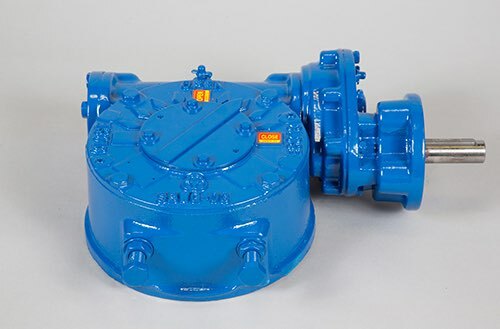 Maintenance schedules based on calendar days are no longer required - with access to cycle count data, you can perform valve maintenance when it is truly needed and replace parts prior to wearing out. Example of StoneL Wireless Link on iPhone. 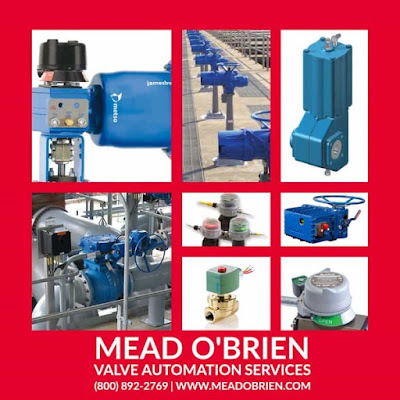 To discuss any valve networking application, contact Mead O'Brien by visiting https://www.meadobrien.com or by calling (800) 892-2769.